Find out what’s on during your holiday, get inspiration from our bucket list recommendations and secure your spot at restaurants, snorkelling and diving, spa indulgences, excursions, beach dining, photoshoots and more. Set on an enchanting private island in the pristine Lhaviyani Atoll in the Maldives, Hurawalhi Island Resort is much like your relationship: it is a perfect match of serenity and excitement, comfort and adventure; it stirs up your every atom with an intricate blend of intimacy and thrill. It is at Hurawalhi that you can fill your days with an unsparing amount of extraordinaires, your mind with wonder, and your heart with romance. The 90-villa, adults-only luxury resort is as brilliant as the ocean that laps against its beaches and more magnificent than any island you have visited. You can swoon over photos of the Maldives, but nothing will prepare you for the beautiful blend of barefoot bliss and contemporary design found at Hurawalhi. At Hurawalhi, you can just be in the moment, be who you are, embrace genuine connections and cherish inner balance unimpeded by outside demands. Villas at Hurawalhi spoil with lavish comfort, exclusivity and mesmerizing views. With the choice of beachside and over-water luxury, you can revel in your preferred perspective and setting, and find pleasure in having paradise at your fingertips - and the ocean on your doorstep. Considered as one of the world's most scenic seaplane journeys, the transfer to Hurawalhi from Male' impresses with breathtaking views of the Maldives' unique scenery. Send your taste buds soaring in a number of dining and wining venues, each affording an atmosphere and views as sublime as the offering. Taking fine dining to a new level: the world’s largest all-glass undersea restaurant 5.8! Hurawalhi is a brilliant blend of romance and leisure, allowing you to laze the days away or opt for an eventful and recreation-filled time. Together is a beautiful place to be. Celebrate your love story and deepen your connection on an island that sets seal on the Maldives' romantic essence. Above, below and by the water, honeymooners and guests looking for a beach break are in for a 5-star treat that holds a perfect balance between tranquility and pizzazz: sublime accommodation, generous all-inclusive service, spa indulgences, marvelous coral reefs and lagoons set seal on the notion that the island is worth a visit. Add to the mix the jewel in the resort’s crown, the world’s largest undersea restaurant ‘5.8’, and it becomes clear why you are bound to fall in love with Hurawalhi. Hurawalhi takes pride in a series of environmentally friendly undertakings and thereby continually works to minimise its impact on the fragile ecosystem that it is a part of. Learn more about why Hurawalhi Maldives is the epitome of Maldives' luxury by downloading the Fact Sheet, which includes an overview of the resort's characteristics and offerings. 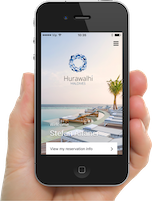 Keep up to date with the latest happening at Hurawalhi Maldives. We are bringing the resort closer to you with regular blog articles so you never miss a thing.